A five-year-old schoolboy was banned from the playground at break times due to his ‘extreme’ skin-fade hairstyle. Josiah Sharpe was told he couldn’t go out and play at Summerhill Primary Academy in Tipton because the back and sides of his hair were shaved. His mother, Danica Sharpe, said the ‘skin-fade style’ haircut helped hide his traction alopecia and gave him a ‘smart, tidy appearance’. 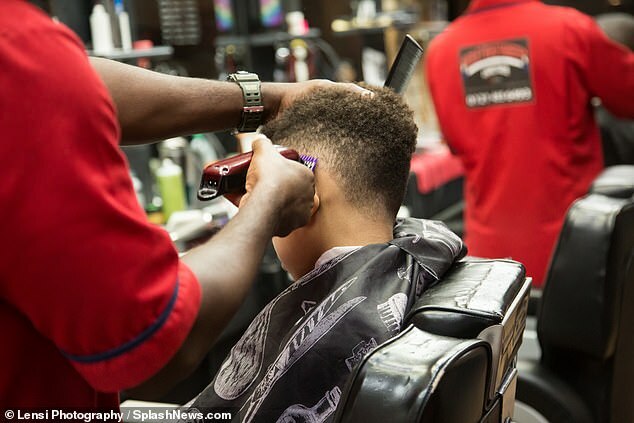 But Kerry Rochester, the executive head of his school, said the youngster’s haircut went against school policy – which states pupils must not have ‘hairstyles that will detract from learning’. Guidelines also specify that cuts which fall below a grade two length are strictly forbidden. Josiah lost his playtime until his hair grew back to a length deemed satisfactory by the school. 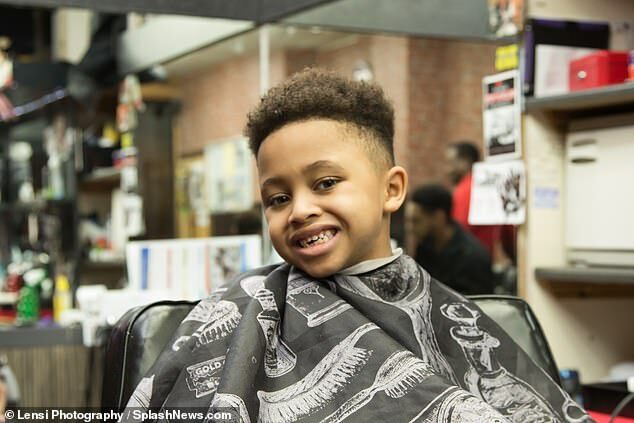 But his mother has now hit out at the ‘harsh’ treatment of her son – adding that the police was ‘culturally biased’ and ‘dictating a hairstyle that’s not suitable’ for her son. 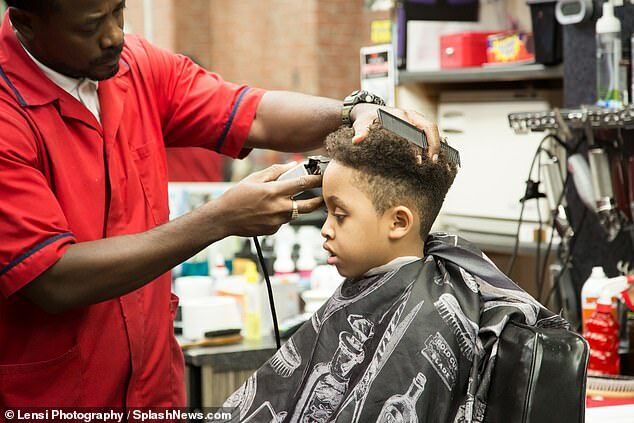 Ms Sharpe, a hair stylist, said: ‘The hair policy lacks cultural awareness as a grade two haircut is not fair for Josiah’s type of hair and others from different racial backgrounds. ‘When he first started there, I did try a grade two haircut but within three days, it had started to grow out and it looked a total mess. ‘In the Afro-Caribbean community, if a boy’s hair is not long and plaited, or put in dreadlocks, we are expected to cut the hair very short for a smart tidy appearance. Ms Sharpe said Josiah has had the same haircut since he was one – and it had only been commented on once before at school. She said: ‘He’s been having this haircut since he was one. The only time the school had said anything about it previously was when he was in reception and he had a patch on the back of his head. It wasn’t there intentionally, it was because he’d moved while at the barbers. Ms Rochester said the school’s uniform and presentation policy was ‘inclusive for all children’ at the school. ‘Unfortunately, Josiah’s hair has been styled in line with what we understand to be the ‘skin fade’ style. His hair is tapered around the back and sides to what is known as ‘zero fade’ or ‘bald fade’. ‘Therefore, the manner in which Josiah’s hair is styled, falls below the grade two length as set out in our policy. What is a skin-fade haircut? The skin-fade haircut, also known as a zero fade and bald fade, is a popular men’s taper fade cut. This recent trend comes in a variety of different styles – including a high, mid and low cut. Fade hairstyles originated in the US military in the 1940s and 50s due to strict rules on grooming. Many celebrities, such as One Direction’s Zayn Malik and Justin Timberlake, have opted for this ‘short on the sides, long on the top’ look. Ms Rochester said the school consulted Afro Caribbean hairdressers in order to reach the decisions made. ‘The family has had, in accordance with the school’s complaints policy, opportunities to state their concerns, both in writing and via a meeting,’ she said. ‘Responses have been provided to the family at each stage of the complaints process, and it’s unfortunate the family have taken this approach before the internal processes have been exhausted. ‘The school has no record of any medical conditions the child suffers from, on medical forms provided by the parents, however as with other children in our school. ‘When presented with medical information we are more than happy to work with parents to discuss amendments to policy, if this is deemed necessary and appropriate. ‘We take our school policies and rules extremely seriously and impress the importance of both within our school community. ‘Unfortunately, if the family continue to ignore the school rules then appropriate sanctions have to be made. 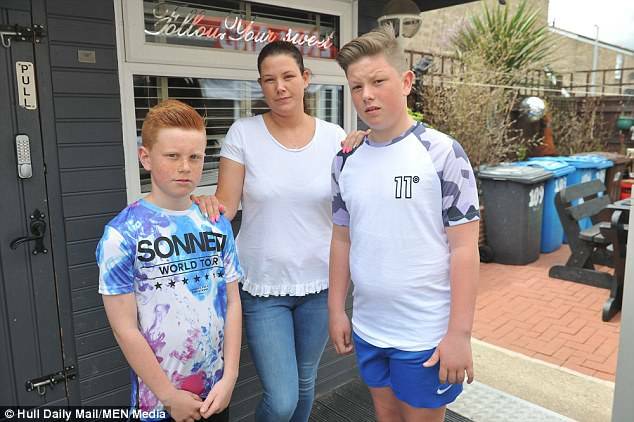 An angry mother has taken her two children out of school after they were kept in isolation because of their ‘extreme’ haircuts. Leroy Wilson, 13, and his younger brother TJ Wilson, 11, were taken away from the rest of their classmates at Kingswood Academy in Hull on Tuesday. 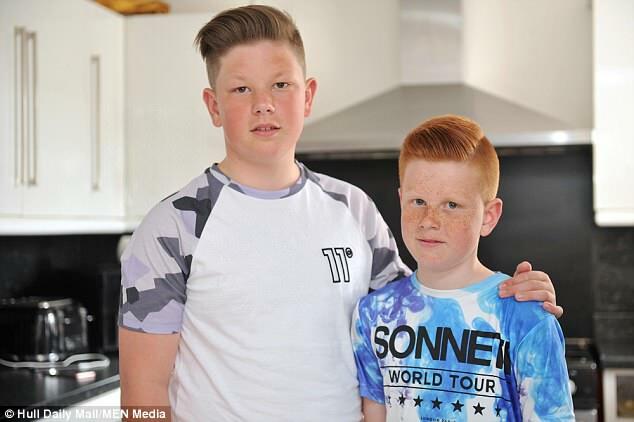 Their mother, Terri Lea Wilson, was told both boys needed to have their hair restyled – but she claimed it would be against their human rights if she forced them to have it re-cut. But the 30-year-old mother sent her children back to school the following day with no changes to their hair and they were put back in isolation again, which resulted in Ms Wilson pulling both of the children out of school. She added: ‘It’s just wrong. They boys are not happy and have said they won’t get it cut. I can’t force them to, especially Leroy – he is 13 years old. ‘I can’t say to them to just go and get it cut because it’s against their human rights and a lot of parents are kicking off. ‘Until they get it cut they are not allowed to go back. I work full-time, I’ve got a day job as a care worker and a night job as cleaner so I can’t really do anything with them. ‘It’s disgusting. It’s a hairstyle and it’s nothing big or major. I wouldn’t like anyone telling you have got to get your hair cut. Why should I? They have no right to do that. The mother is adamant that her children should not be made to have their haircut again. Leroy’s hair is brushed to the side with a quiff while TJ’s is short on the sides with a line in it. Ms Wilson added: ‘My husband went to the headteacher and he said, “How can I drag a 13-year-old and an 11-year-old when they are going to fight with me and refuse? I’m going to get locked up, I just can’t”. A spokesman for Kingswood Academy school said: ‘We at the academy have the highest of expectations regarding uniform – including hairstyles – which have been in place for the last three years. ‘These expectations are made very clear in the uniform policy which is shared with parents and students annually, and is also displayed on the website. ‘Any student who fails to meet the standard is allowed to go home to rectify the issue, if not they are placed in isolation. ‘Out of the 804 students on roll, 801 students regularly meet the expectations consistently, lesson in, lesson out. Leroy and TJ are not the first pupils to be penalised by their school for getting fashionable haircuts. Below is an example of students who have been disciplined by their school in the past 12 months for their haircuts. Lucian Smith’s parents allowed him to have lines cut into his hair during the Easter holidays, thinking it would grow back by the time term started. But when he turned up to lessons on his first day back at Templars Academy, in Witham, Essex, he was hauled into isolation during break times over the ‘inappropriate’ style. Khai Okojie was banned from a Christmas carol concert because of his ‘extreme’ haircut. He had to stay in class at Ellenbrook Community Primary in Salford, Greater Manchester, yesterday while his friends sang carols at a nearby church. Macauley Wade, 16, was accused of having an ‘extreme haircut’ because his hair was tied in a bobble at Havelock Academy in Grimsby.